The call came in from the Run of the Mill Pub in Saco about a swarm clustered on a sapling tree near the riverwalk. Once we arrived we realized all the people on the patio of the pub would be our audience for the afternoon. The plan was simple: Meghan Gaven was atop the stepladder and would push the little tree downward while Richard McLaughlin pulled the same direction with a rope. All I had to do was stand below it and catch the swarm into my tote. First, we laid the sheet on the ground under the swarm. I spritzed a little syrup on the cluster; then, on the count of three the swarm was shaken from the tree. Easy. Except, yet again, my estimation of where the bees would fall was off by about four inches. Two thirds of the bees fell into the tote and the other third or so fell all over my forearm; many ended up on the sheet. From a distance it was artful and the audience on the patio burst into applause. But the bees were not pleased with the miscalculation and began stinging my arm. Still, I had to play it cool; I was wearing my Swarm Team Six jersey. The Swarm Team doesn’t flinch. Wincing, I put the tote down on the grass and discreetly pulled out the five stingers. I usually need in my swarm kit right on the lid of my tote. A little element of risk, the promise of adventure, and an adoring public make swarm wrangling my favorite summertime activity. The main rules are two: be prepared, and be prepared to improvise. I fashioned my swarm wrangling kit from an oversized tote I use to harvest honey supers. It’s bigger than necessary, but I like multi-use tools. When the nectar flow is on from May through July, the box holds my swarm gear. Then swarm season takes a little break at the end of July and early August and I use the box for honey supers. The end of August and early September are the second (slightly smaller) swarm season and then the box becomes available again for the fall harvest. Swarms, in my experience, rarely show up on a day or time that is super convenient for me. But when it’s time to go, time is of the essence. To avoid forgetting essential tools, I wrote the items I usually need on the lid of the tote. And I’ve added one more critical tool: Duct Tape. Tim Forrester’s swarm kit is more compact and he’s taken the time to integrate a permanent screen into the lid as ventilation for the captured swarm. My tote is absurdly big and just has some stab-holes from my penknife for air. Tim Forrester’s swarm kit tote, fitted with a screen for ventilation. Erin Forbes and other people who fill their days in an office environment love the sturdy boxes from reams of paper. The lids are perfect. One swarm call rarely poses the same challenge as another, so the first step at each one is to assess the situation and come up with a plan; this is where the art of improvisation comes in. I’ve done a lot of branch shaking, but have also scooped bees with a flower vase, cut a branch and put it into the tote, banged branches from underneath with my Bee Brief, and on a day pressed for time I’ve even run a huge extension cord and used the bee vacuum. This summer seemed to have branches just out of reach — 20 feet up and far from anything that could support a ladder. On two occasions we resorted to ducttaping a bucket to the longest thing we could find: first a broom handle, then two pieces of wood strapping ducttaped together. Dan Gray, one of the world’s great tinkerers, fabricated a high-grabber from a water jug, a painter’s extension pole, and some good epoxy — a gadget design that Karen Thurlow-Kimball shared at a CCBA meeting this spring. I think any beekeeper can learn to love swarm wrangling. All it takes is a love of bees, a sense of fun, and a little creative thinking. August gives us a little rest from swarm season but think about getting your kit together to go catch some late season swarms. Dan Gray proudly displays his handy swarm grabber, fabricated from a heavy duty water jug and painter’s extension pole. 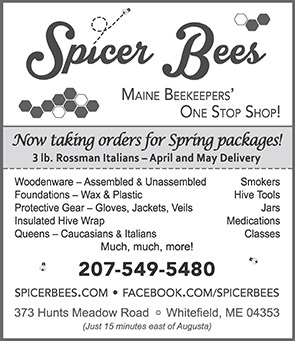 My Swarm – Maine Swarm Hotline to the Rescue Preparing for Swarm Season Now, This Is a Swarm! Remember That Swarm Trap?